Verena has two BScs, one in Cultural Anthropology and one in Computer Science, from Ludwig-Maximilians-University in Munich, Germany. During her BSc she also spent one exchange semester at the National University of Singapore which inspired her to her first BSc thesis on the construction and perception of multiethnicity in this city state. 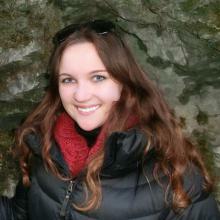 She dedicated her Computer Science thesis to the exploration of the mutual benefits of Computer Science, Cultural Anthropology and Psychology for the analysis of structure in social networks. Her participation in an interdisciplinary research project which focuses on the effects of diversity within a team on motivation and well-being helped her gather some of the background knowledge from Psychology. Thus her research interests cover an interdisciplinary area ranging from social network analysis, agent-based-modelling and graph analysis to questions on identity and diversity. She is currently in her first semester of a Computer Science master at Ludwig-Maximilians-University and also pursuing an additional certificate in Intercultural Communication which she hopes will supplement her background in Cultural Anthropology. Verena plans to spend the Fall semester 2017 at Simon Fraser University in Vancouver, Canada. At CRESS she is contributing to the ISABEL project and working on the extension of the existing participatory evaluation tool by using graph analysis methods. Potentially the theory of change will be used as a theoretical framework.